New license required - see below for details! NATview is an easy to use visualization and configuration tool for any MicroTCA system that includes a NAT-MCH. NATview allows the user to view and manipulate the components of the MicroTCA system in a graphical way. NATview runs on any host computer that is internal or external to a MicroTCA system and can be started from a USB thumb drive. 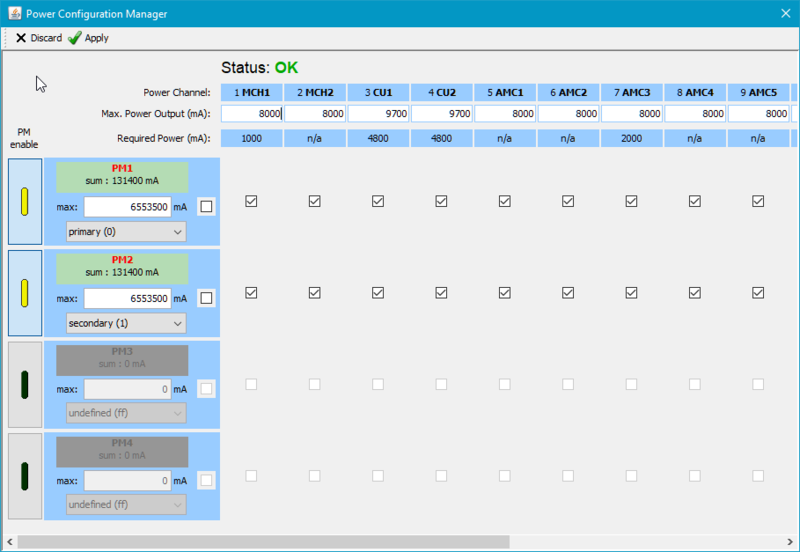 Thus NATview is ideally suited for any system or support engineer to check and analyze the status of a MicroTCA system. NATview is a host based Java GUI suitable for any operating system which can execute a Oracle Java v1.8 or higher, i.e. Linux, MacOS or Windows. Besides Java there is no need for further libraries or driver. 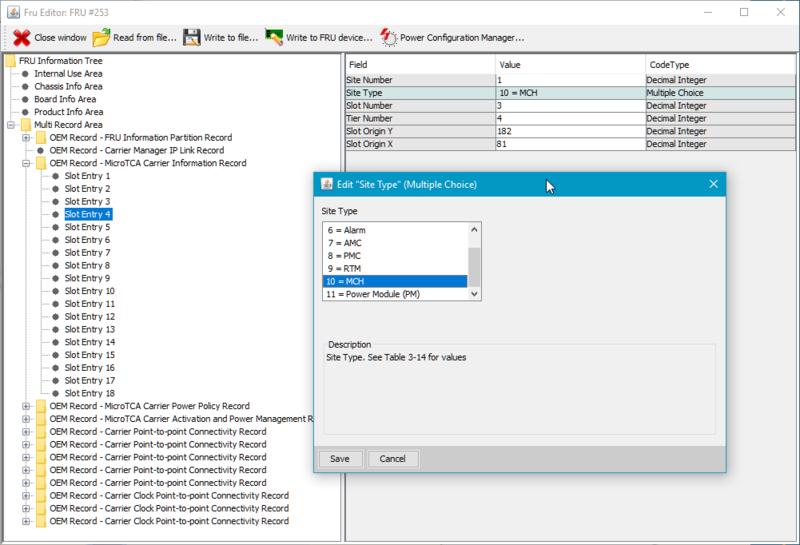 NATview connects to the NAT-MCH using the Remote Management Control Protocol (RMCP) as requested by the MicroTCA specification. The RMCP host part is included in NATview, so no additional protocol support is required for the host. The MicroTCA system is identified by the IP address of the NAT-MCH. 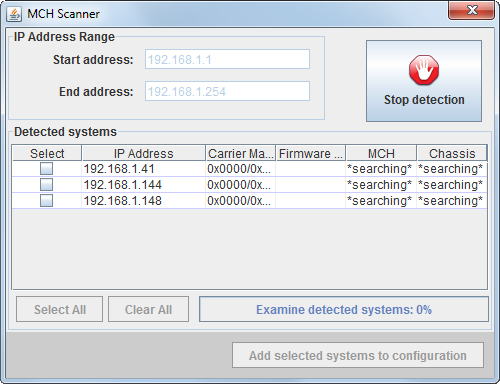 In case the IP address is unknown, the integrated address scanner can be used to scan for NAT-MCHs available within the selectable address range. The selected IP addresses can be stored in the initialization file of NATview. Vertical. In this case the AMC modules are mounted side by side in a row. The hot swap LED and its handle are in the bottom right corner of the module. NATview calls this orientation north. Horizontal. Here the AMC modules are mounted one above the other; sometimes multiple rows exist. The hot swap LED as well as the hot swap handle are located in the top right corner. This is NATview direction west. It is a single bit in the Carrier Information Record that is used to distinguish between these two AMC board orientations. If the chassis designer arranged the AMC modules in a different, non-standard manner NATview could not determine the correct orientation. Therefore the chassis INI file can be extended in such way that information about the AMC slot orientation is being coded into the slot dimensions. NATview offers a photo-realistic view of the chassis including AMCs, power modules, cooling units and the NAT-MCH with all their sensors. Klicking on any of these sensors will display its current status/value and depending on the type of the sensor also the defined thresholds, i.e. upper and lower non-critical, critical or non-recoverable. 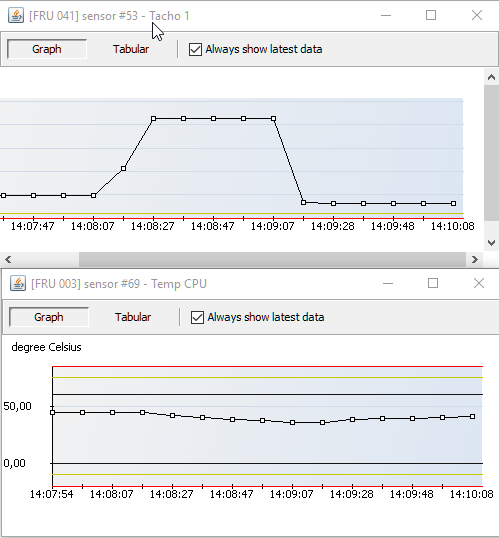 NATview can be configured to periodically update the displayed sensor information and to display the read sensor values in a separate trend diagram. The Backplane Viewer displays the available connections between the AMC slots and the MCH slot as provided by the backplane and highlights which of these connections are matching as per the e-keying process. 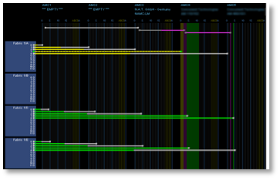 Different colours indicate different protocols such as GbE, PCIe, SRIO or XAUI. Moreover, NATView can also display if any of these matching connections carries an established and working protocol link. In a MicroTCA system certain information about a FRU is stored in an EEPROM that is located on the respective FRU. The backplane FRU for example holds the information about all available connections between the AMC slots and the MCH slot and by which power source every AMC slot is powered. By default these EEPROMs are programmed by the respective vendor. 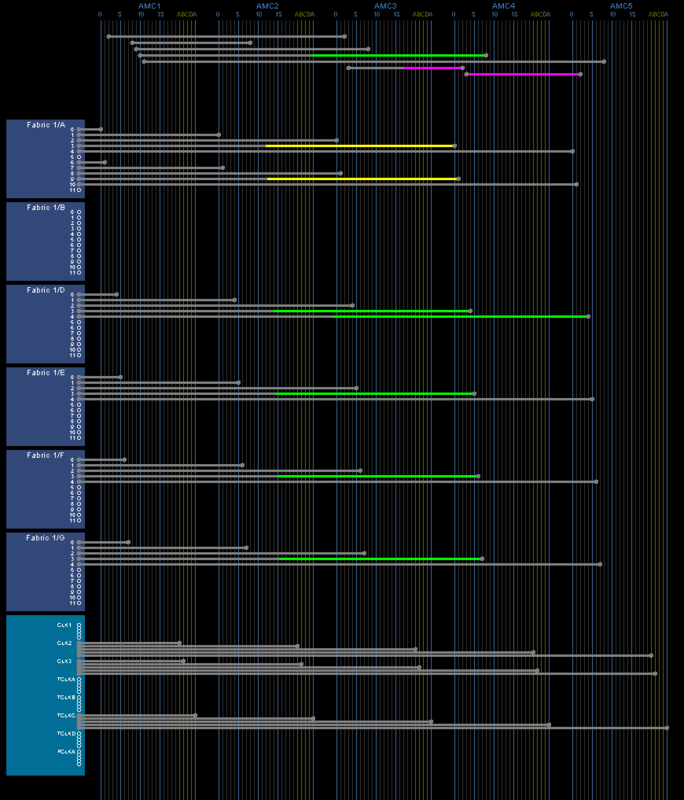 However, sometimes it becomes neccessary to change some of the FRU data, i.e. for system configuration or final fine tuning. The optional FRU Editor contained in NATview-FE provides the tool to manipulate these records. The Power Manager -- which is part of the FRU Editor --allows to view and change the Power Policy of the system in a very elegant way, e.g. for defining a redundant and/or load sharing power configuration. Hardware Platform Management (HPM) is a standardized protocol to update any programmable part of a FRU inside a MicroTCA system, i.e. 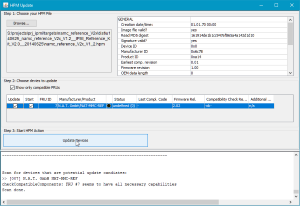 FPGA images, EEPROMS, Flash memories etc.. Apart from the binary data to program the device the HPM update files contains information about which FRU and which part of it to update, any compatibility requirements and other neccessary information needed to ensure a healthy update. These HPM files are provided by the vendor of the respective FRU. 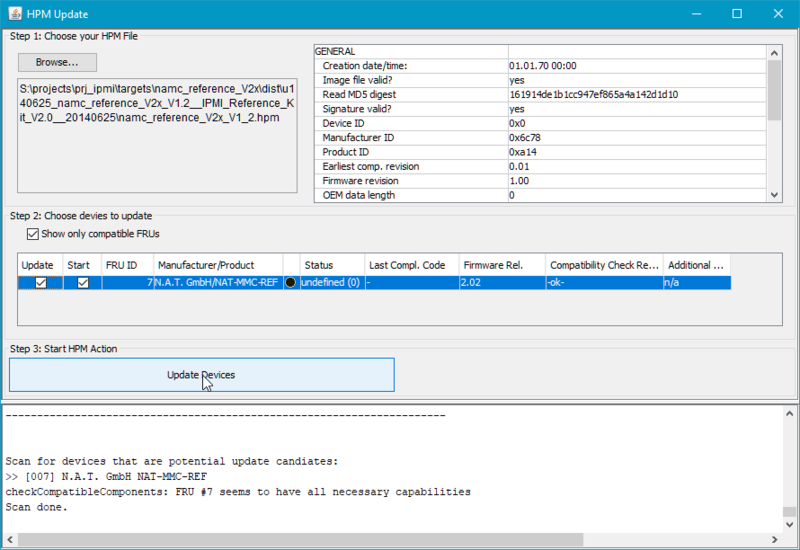 The optional HPM Update Manager contained in NATview allow users to view the contens of an HPM update file, to select records from its content and then to perform an update of the resepctive part of the HPM compliant FRU. NATview 3.00 is able to check if there is a new version available on the N.A.T. FTP server for you to download. You will not miss updates anymore! The application help viewer has been extended to cover all new features of this release. The basic version of NATview is called NATview-EASY and is available free of charge with any purchase of an NAT-MCH. 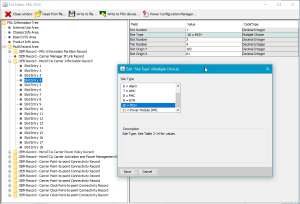 Licenses for the FRU Editor NATview-FE and the HPM Update Manager NATview-HPM are offered as separate add-on licenses to NATview-EASY. All licenses are personalized, however, please contact your sales contact for competitive bundle and corporate licenses. NATview can accomodate the personal look-and-feel. 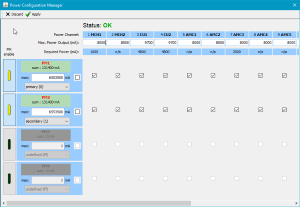 Moreover, NATview allows the user to add own images for the photo-realistic display of AMCs and chassis and thus be easily adapted to even display custom components. Shows payload voltage and payload current for every AMC module. 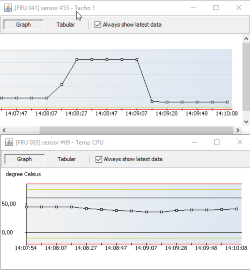 Indicates failures due to exceed payload current requests. Checks for new NATview releases on startup - never again miss an update!